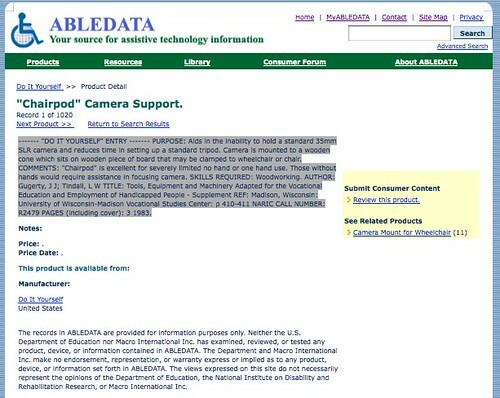 Abledata is a very web 1.0 repository of assistive technology product metadata. It lists thousands of disability and accessibility related *things* and ideas, with citations to the source of the information. There’s a secret corner of Abledata: the DIY assistive tech listings. If you click through “products”, then “non commercial products”, you’ll get to the DIY link. For example, this camera tripod mount for no-hand or one-hand use. It’s a sentence or two describing the concept of the device or invention, then a bibliographic reference. There’s no plans, photos, designs, links, capacity for tagging. While there’s a “Review this product” link to the side of each page, it doesn’t actually associate with the product or design. There is merely a separate page that gives an alphabetical list of anything that has gotten a review — without threading or real attribution or identity information on the comments. Sooo, like blog comments, or a forum, but a million times worse. The Abledata DIY repository is a start, and it seems to be useful data. The ideas are useful to think over. Yet I can’t mess with that data in any useful way. There is no API that I can find to pull the data out of the database. My feeling is since it is a public government funded work, the data should be openly accessible and usable. Then, anyone could build applications to use this data. As it is, I’m sure I could write a little script to crawl all 41 pages of this data pretty handily and do something with it. Compare the Abledata site, segregated off into a little silo, with the Instructables Assistive Tech group. Each DIY project is clearly described, with how-tos, photos, video, places for threaded comments and feedback by readers and people who might make the project themselves. Take a look at Build a Motorized Window Blinds Controller. It lists materials and costs (about $15.00). There are 60 people in a lively discussion of the idea including people trying it out and getting advice from the original inventor. The original inventor can easily edit her own project and add clarifications, based on feedback from the crowd. It’s a thing of beauty. Abledata project may not have the expertise to convert their site into something with crowd sourcing power. (Though, it would be like a 1 week long project to just stuff it all into Drupal and fancy it up a bit.) But they could *easily* make their data available by download or by API. Why not do it? I think it is part of the mentality of control and fear that surrounds disability and assistive tech as “medical” information. Give it up, people, let go of that. Get with the times.